Compressed Air Best Practices® interviewed Norman Davis, Jr., President of ENMET, LLC. Good morning! Tell us about ENMET and detection solutions you offer for monitoring gases in medical air systems. Norman Davis, Jr., President of ENMET, LLC. Our products include medical verification instrumentation, compressed airline monitors, and single- and multi-gas detectors along with ambient air oxygen monitors. Many of these systems are designed to ensure compliance with NFPA 99 (National Fire Protection Agency) Medical Air Systems Guidelines and OSHA monitoring requirements for Grade D breathing air. ENMET was founded in 1970. We’re headquartered in Ann Arbor, Mich., with offices and manufacturing facilities in Kentucky and Michigan. In addition to providing gas detection solutions worldwide, we offer expert technical assistance, as well as advice on system installation and training. What NFPA 99 guidelines apply when it comes to monitoring of medical air systems? The NFPA 99 Standard for Healthcare Facilities (2005 Edition) provides requirements for medical gas systems in health care facilities. Our technologies provide air and gas analyses that are essential for meeting these guidelines. These include both Level 1 and Level 2 Medical Piped Gas and Vacuum Systems of NFPA 99. We monitor and detect target gases commonly found in compressed air systems of hospitals and medical facilities. In these systems, a medical air compressor produces air at 100 psig and feeds it at this same pressure to medical air dryers and filters. The air is then pressure regulated to 55 psig and distributed for use in Level 1 or Level 2 applications. End-use pressure is 50 psig to account for pressure drop. What are NFPA 99 requirements that pertain to medical air dewpoint? The need to monitor dewpoint in medical compressed air systems is as critical as it is for detecting targeted gasses. The code requires the compressed air system dryer to provide air at a pressure dewpoint of 32 oF (0 oC) at any level of demand. It also states dryers must be sized to deliver the specified dewpoint at peak-calculated demand. This means the compressed air dryer must provide air with a dewpoint of 32 oF at 33% or 100% load. Our monitoring systems are engineered with numerous alarms to notify users about the status of the medical air system’s dewpoint. What does NFPA 99 specify with regard to medical air dewpoint alarms? It calls for the need to monitor dewpoint at the dryer’s control panel, as well as downstream after the regulators have reduced the pressure from 100 psig to 50-55 psig. If the monitoring system detects any presence of moisture it will trigger downstream alarms. When will alarms trigger given the need to meet NFPA 99 requirements? Dewpoint shall be monitored and shall activate a local alarm and all master alarms when the dewpoint at system pressure exceeds +4 °C (+39 °F). Dewpoint and carbon monoxide monitors shall activate the individual monitor’s signal at all master alarm panels if the monitor loses power. Our MedAir 2200 Compressed Airline Monitor detects both hazardous gases and the dewpoint, which are common threats to the purity of air in medical air systems. What types of gases does the MedAir 2200 monitor and how does it work? It detects carbon monoxide (CO), oxygen (O2), carbon dioxide (CO2), Volatile Organic Compounds (VOCs), trace hydrocarbons and several other hazardous gases. It is also designed to meet monitoring requirements for Occupational Safety and Health Administration (OSHA) Standard 29 CFR 1019.134 Grade D compressed air breathing requirements. The monitor is connected directly to a compressed gas supply bleed flow. The sample inlet pressure must be regulated to 55 psig. It continuously collects a sample of the compressed air by means of pressure reduction, which is passed over electrochemical CO and O2 sensors, an infrared CO2 sensor and a solid-state dew point sensor. This process results in electrical changes and outputs that are used to evaluate the air for target gases. It also has an integral electronic sensor with a fault alarm to monitor for low-flow conditions of less than 0.2 liters per minute. Sensor data can be integrated into a process logic system (PLC) using a digital communication protocol, or analog 4-20mA outputs. The MedAir 2200 also has integral local alarms providing both audible or visual alarm warnings. The MedAir 2200 has integral local alarms providing both audible or visual alarm warnings. Please elaborate on how these sensors detect target gases. With an electrochemical sensor, which measures CO, and O2, the gas diffuses into the sensor, through a porous membrane to the working electrode where it is oxidized or reduced. This electrochemical reaction results in an electric current that passes through the external circuit. The chemistry of the cell is designed to favor a chemical reaction that matches the gas of interest. The detection mechanism of electrochemical sensors is usually only suitable for gases that are electrochemically active. The sensors have low-level detection limits and long operational lifetime. To measure C02 with the infrared sensor, a Light Emitting Diode (LED) is energized. The frequency of the light then excites the gas molecules, which causes absorption of the light or energy. Small changes to this process signify the presence of the gas and or absence of the gas. More specifically, the gas absorbs some of the infrared wavelengths as the light passes through it, while others pass through it completely un-attenuated. The amount of absorption is related to the concentration of the gas and is measured by a set of optical detectors and suitable electronic systems. The change in the intensity of the absorbed light is measured relative to the intensity of light at a non-absorbed wavelength. The instrument computes and reports the gas concentration from the absorption. How does the monitor detect dewpoint of a medical air system? It utilizes a dewpoint sensor that operates through the use of a conductive polymer membrane technology. The membrane absorbs and releases water vapor, or humidity. The membrane has an electrical charge corresponding to a water absorption that can be converted by temperature into a dewpoint reading. Given the importance of dynamic range, the dewpoint sensor must be able to report accurately the low levels of humidity. For most compressor applications, the dynamic range is -46 °F to +140 °F with accuracy to ‑3 °F as displayed in degrees. To what extent does the monitor require calibration and maintenance? The nature of the ambient environment determines the frequency of calibration. Once a pattern of behavior is established, users can determine the actual frequency of calibration. Generally, quarterly checks are a good place to start. In aggressive hot or cold environments, we recommend monthly calibration checks at first. These intervals can increase over time based on results. In any case, keeping calibration records and response trends are essential to ensure the monitors are working to specification over time, ensuring the breathing air is safe. Each sensor in the MedAir 2200 has a specific lifetime associated with the sensor technology. Electrochemical sensors last two to three years each and infrared sensors five years each. Dew point sensors have a long life and have a calibration interval of two years, which is when they can be factory refurbished, recalibrated or replaced. 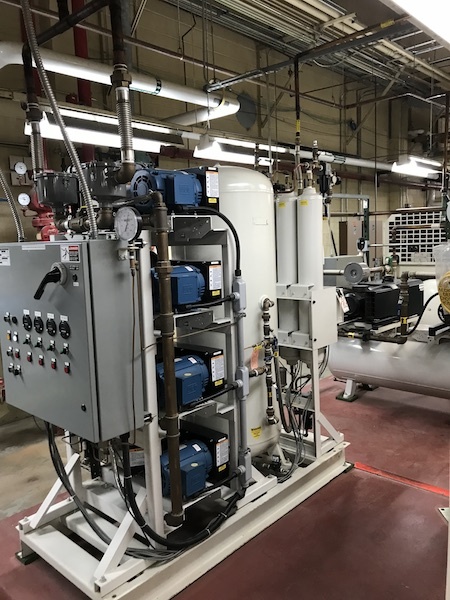 NFPA 99 requires independent testing of medical air systems, which means the company that installs air compressors as part of a medical air system cannot perform verification tests. 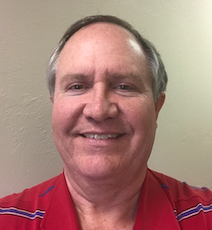 That’s where medical gas verifiers come in, said Corky Bishop, P.E., CMGV, certified Medical Gas Verifier with Apex Medical Gas Systems, Oklahoma City, Okla. Corky is also president of the Medical Gas Professionals in Healthcare Organization (www.mgpho.org). Corky Bishop of APEX Medical Gas Systems. “A medical air contamination test is required whenever a hospital or healthcare facility gets a new air compressor package, or replaces a major component in the source equipment,” Bishop said. In addition to testing using independent third party, the tests must be performed by a credentialed American Society of Sanitation and Engineering (AMSE) 6330 Medical Gas Verifier. Bishop said medical air system tests are performed to ensure compliance with NPFA 99. Test results must meet specifications in accordance with Medical Air USP as outlined by the U.S. Pharmacopeia (USP), which is a pharmacopeia and essentially a compendium of drug information. Bishop said in addition to medical gases a key concern in medical air systems is air moisture. The bottom line, said Bishop, is ensuring patient health. A medical air compressor at a healthcare facility. For more information, contact Corky Bishop P.E., CMGV, Apex Medical Gas Systems, Oklahoma City, Okla., email: corky@apexmedicalgas.com; tel: 405-728-1272. What trends do you see in medical air systems and NFPA 99? One clear trend is growth in verification of medical air system gas purity to ensure compliance with the standard. Verification tests are conducted during the construction phase of new buildings, or remodeling projects. The tests are also conducted periodically as required by NFPA 99. They are in addition to continuous monitoring. Who performs these tests and how are they conducted? To service this market, we developed our MATRIX portable gas monitoring system, which is an eight-channel, multi-sensor system that monitors CO, O2, CO2 (PPM and percentage volume), CH4, N2O, trace hydrocarbons, anesthesia gases and dewpoint. It’s a self-contained system that eliminates for multiple monitoring systems to perform the tests. Whether it’s continuous monitoring or gas verification, our systems provide the information hospitals and healthcare facilities require to satisfy NFPA 99 and to ensure the medical compressed air system delivers purified medical air to patients. The MATRIX portable gas monitoring system monitors CO, O2, CO2 (PPM and percentage volume), CH4, N2O, trace hydrocarbons, anesthesia gases and dewpoint. Thank you ENMET for your insights. For more information, please contact Norman Davis, Jr., ENMET, LLC, Ann Arbor, Mich., email: ndavis@enmet.com; tel: 734-761-1270, or visit www.enmet.com. To read similar Medical Air articles please visit www.airbestpractices.com/industries/medical.